GCA Altium has advised AXIO Aviation Holdings on the sale of OAG, the leading provider of global flight information, to Vitruvian Partners in a deal worth approximately $215m. This is the latest in a series of significant technology transactions for GCA Altium, following on from the sale of SAP specialist Edenhouse in December 2016, and the sale of Urban Engines to Google in October 2016. OAG is the global leader in aviation information and intelligence, providing customers with flight schedule and status information, in addition to related data analysis tools. The company’s flight information database holds future and historical flight details for over 900 airlines and more than 4,000 airports, offering unprecedented insight into scheduling and planning, flight status and day-of-travel updates, post-journey analysis and on-time performance. With the most extensive real-time flight status database in the market, OAG’s flight status database delivers 35 million flight status updates daily. Headquartered in Luton, UK, OAG serves the air travel community from its global network of offices situated in the USA, Singapore, Japan and China. The company has been an industry success story, redefining its strategy following its acquisition by AXIO out of UBM in 2013, with unprecedented growth in recent years underpinned by an experienced executive leadership team, led by Phil Callow. OAG serves a wide range of customers across the travel sector including airlines, airports and airport services providers, travel distribution players, government agencies, aircraft manufacturers, consultancies and corporate consumers. 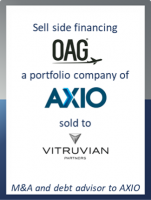 OAG was acquired by AXIO (a management company, backed by Electra Private Equity) in early 2013 as part of a collection of data-focused businesses carved out of UBM Plc. The sale of OAG represents the fifth major realisation from the AXIO portfolio with two businesses remaining. The transaction provides a full exit for AXIO and offers the opportunity for additional members of the management team to participate in the equity structure going forward.